1. This year is one of evolution for the Ninja ZX-6R as opposed to revolution, with a few choice revisions and a first for the segment overall. The ZX-6R been given a once-over in the looks department, received a quickshifter, revised gearing and gotten some fresh rubber, while all other hard parts remain the same, including the 636cc motor. Also intriguing is a sub-$10k MSRP for the standard non-ABS ZX-6R. 2. The 636cc inline-4 engine has always been a charmer, and in 2019, it still is. Yep, it’s the same version of the motor debuted in 2013. Kawasaki first went to 636cc on the non-WSS bikes in 2002, mainly to increase available torque, which now stands at a claimed 52 ft/lbs at 11,500 rpm. That’s important for those of us that’ll be tackling the streets aboard our sport bikes, giving a bit more power on the bottom end and mid-range than your typical 600cc Supersport, making it more favorable for use on the road than some of its competitors. 3. From the moment you roll away, the 636cc is smooth and pulls well into the upper regions of the rpm band. Kawasaki representatives did mention revised fuel mappings to meet Euro 4 standard, and we’re glad to hear that it won’t be changing any of the dyno numbers from last year. Still, the ZX-6R has plenty of wallops to hurl you down a track or keep up with anyone in the canyons. 4. Below 7000 rpm there’s a decent amount of power on tap, but things start picking up quickly as you progress through the rev range. On a technical circuit like the one we were riding, more power would have just gone to waste as its 110ish horsepower hits the sweet spot. Tie all of that up with the standard slip-and-assist clutch, and that’s more than a nod-worthy emissions compliant package. 5. Final drive gearing has been shortened to 15/43. Tightening up the gearing is something many canyon carvers have done to the ZX-6R for years. Kawasaki wanted to give the 2019 Ninja ZX-6R a little more pep in its step off the line, as inline-4s can be quite tame at lower rpms. In practice, it’s a good move for anyone that’s going to be spending a lot of time on the streets. I felt like it was spot-on for tight circuits such as Las Vegas Motor Speedway. If you ride tracks with long straights, consider reverting to the previous sprocket combo. 6. Full and Low power modes power modes are available. Full power is self-explanatory, while Low power gives 80 percent of available horsepower and torque, while also taming the throttle response. 7. An up-only quickshifter is now standard. That’s a first for the Japanese 600 supersports, though Euro competitors such as the MV Agusta F3 675 are so equipped. It’s a great addition and comes into its own on track when you’re winging through the gearbox on straightaways. Shifting from 1st to 2nd gear can be rough, though as you make your way deeper into the gearbox, the shifts smooth out. Shorter kill-times would benefit the package overall. 8. 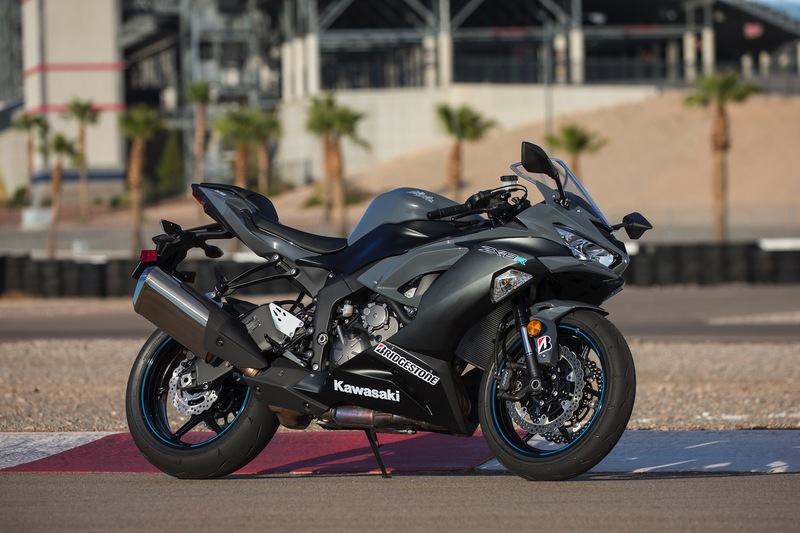 The 2019 Kawasaki Ninja ZX-6R is sporting new Bridgestone Battlax Hypersport S22 kicks. More than a worthy follow-up to the Bridgestone Battlax Hypersport S21, the S22 is a new model from the Japanese tire manufacturer. The S22 pairing boasts a new rubber compound that aims to give better grip in the dry. Unsurprisingly, our ride through the Nevada high-desert was dry, and the S22s gave great feedback and grip. Also, Bridgestone optimized the siping pattern to allow for improved wet performance. In the rear, specifically, a rubber compound with finer silica particles was utilized for greater traction in bad weather; we’ll have to take their word for in that regard. In all, the S22 120/55 front and 180/55 rear combination is a good fit for the ZX-6R. 9. We gave the 2019 Ninja ZX-6R the factory treatment and used Bridgestone Battlax Racing R11 tires on the track. When we headed out on track on the non-ABS ZX-6R, we opted for some choice DOT track rubber. As such, the DOT tire is recommended to be paired with tire warmers and will require you to be more conscientious of tire pressure and suspension settings. All that aside, the Bridgestone R11s offer massive amounts of grip with tons of feedback to match—I was grinning ear to ear. 10. Traction control is standard on the ZX-6R. The traction control system offers three levels of adjustment. The Level 1 setting is least intrusive and Level 3 is the most aggressive. On the track, I ran the Ninja in Level 1 without feeling like it was holding me back. With TC turned on, it gave me a bit of a watchful eye on my shoulder when I’d make a mistake. 11. The ZX-6R remains quick on its feet. The 2019 Kawasaki Ninja ZX-6R handles admirably and is everything that you’d expect from a middleweight sport bike. Thanks to the shorter gearing, the wheelbase has been marginally lengthened to 55.1-inches. This makes the ZX-6R quite stable on the edge of the tire. Because the frame and swingarm remain the same, so too, does the sporty 24.5-degree rake. In fast sweepers on the street, or when tackling some of the technical ascending turns on the Road Course, the ZX-6R responded to all my inputs just as I’d have liked with quick yet predictable turn in rates. 12. Fully adjustable suspension helps you get it right. We tooled about the greater Las Vegas area on the street with the stock settings. The 41mm Showa SFF-BP fork and linkage-assisted Showa shock performed commendably, soaking up plenty of the rough patches while keeping the chassis planted. 13. On the track, we cranked up the suspension settings and raised the rear ride height with an 8.5mm shim. The stock ZX-6R comes with a 2mm shim in place, and with the additional 8.5mm shim, we’d raised the ride height to 10.5mm overall. We were met with a much more pointed, stiffer set up that was more than able to cope with faster paces, while also improving its turn in rates without introducing instability. Under heavy braking and a few tight, bumpy corners on the Road Course, I was more than pleased with the result once we got the set up dialed. For someone of my skill level, I’d be content with the stock kit. 14. Go-fast bikes need to stop-fast brakes, and that’s just what they do. Up front is the same dual 310mm floating rotors with four-pot radially mounted Nissin calipers doing the heavy lifting, as well as a radial master cylinder. In the rear, a single 210mm rotor gets the job done. Feel at the lever is good, allowing for excellent feedback when trail braking and sending the ZX-6R into corners. When on track and after a few healthy laps, a little fade began happening due to the rubber lines, but it seems to level out without reducing braking power too much — toss those in the scrap heap and swapping for some steel braided lines should fix that up instantly. Adjustable levers are now standard. 15. ABS is an option. Setting you back a cool $1000 for ABS might sting a bit, but here’s where we’ll soothe you—you’re still coming in several hundred dollars lower, if not a couple thousand, against every comparable competitor. On the street, the ABS was never engaged unnecessarily, so the system works properly. 16. The 2019 Kawasaki Ninja ZX-6R gets a change in ergonomics. Though the rider triangle has gone unchanged, a shorter seat length from the front to back is noticeable, while the height remains the same 32.7-inches. This means you are more forward on the motorcycle. Also, the seat has been narrowed where it meets the tank, slimming the bike a bit and helping those with shorter inseams get their boots to the ground. 17. Kawasaki designers want to create cohesion by aligning the Ninjas aesthetically. This year, the Ninja ZX-6R takes some inspiration from its big brother, the ZX-10R, which also got an update of its own. Visually, we see much sharper lines taken, and even the nose fins from the supercharged H2 come into play. A new rear cowl with upswept lines gives it a much more race-ready look, too. Additionally, designers sharpened the nose and lowered the windscreen to give it a more aggressive posture. On the street, the lower windscreen didn’t cross my mind. However, on track, and with higher speeds in the mix, it was tough to tuck behind the bubble with my 5’10” frame. If you’re going to spend a lot of time on track, moving to a taller windscreen could be beneficial. 18. LED lighting is now standard on the 2019 Kawasaki Ninja ZX-6R. As part of the updated looks, the Ninja will shine brighter in the night. It’s a small update, but a welcome one, as standard bulbs are dull in comparison. 19. A new dash for a new Ninja. Reminiscent of the previous middleweight Ninja, the updated dash displays several new items of information in the form of a fuel gauge, remaining range, current and average fuel consumption, intake air temperature, clock, and more. On a 600-class Supersport, my only requirement is an analog tach that needs to be sent flying. Luckily, that’s just what we have on the ZX-6R. 20. Pricing on the 2019 Kawasaki Ninja ZX-6R begins at $9999. We haven’t seen a track-ready Supersport motorcycle coming in below 10k in a long time. The ABS model comes in at $10,999 and the sweet KRT livery adds $330 to that. If you don’t want ABS, the base ZX-6R is $1400 less expensive than the Suzuki GSX-R600. As the Honda CBR600RR and Yamaha YZF-R6 cannot be had without ABS, we’ll compare their MSRP to ZX-6R ABS price—the Honda is $800 more than the ABS-equipped ZX-6R, and the Yamaha $1100 more. With this pricing structure, Kawasaki is hoping to reinvigorate the class. 21. The 2019 Kawasaki Ninja ZX-6R might kickstart a middleweight supersport war, and I can’t wait. I’m not one to count my chickens before they hatch, but I’ll also remain hopefully optimistic that the sub-$10k base price will bring enough riders back to 600 Supersports. The R6 was updated last year and these two machines could be the spark that lights the fire. Superbikes have their charm, but wailing on a middleweight Supersport, learning to carry your momentum through corners, and braking late will bring smiles to all riders who like to get their heart rates up. With the addition of a quickshifter and a few other updates, the 2019 Kawasaki Ninja ZX-6R checks all the Supersport boxes, so here’s to stoking the 600-class flames in the coming years.